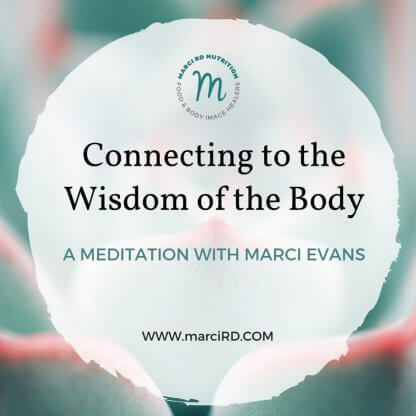 Connecting to the Wisdom of the Body - Marci R.D. So often, we live our lives in our minds, totally disconnected from our bodies. The wisdom and information that our bodies have to offer is totally subjugated to the judgments and ideas of our busy and often critical minds. This common pattern leads to choices that are disconnected from our inner compass and fuels the notion that we must rely on rules and even other people’s rules to live our lives! This meditation is an invitation to take time to practice (and it is a practice!) to listen in and respond to the information our body is sending us. By listening, responding to, and learning to trust the communication from our body, we begin to heal our relationship to it. While this may sound dramatic, this healing will help you to develop a better relationship to food and a better body image. In this particular practice, I invite you to connect to uncomfortable feelings and sensations. You know, the stuff we usually stray from the most! Just wanted to give you a heads up before you dive in. After you listen to the meditation, let me know what you think! Please complete this form and click the button below to gain instant access! Which one of the following best describes you?